Royal College of Art (RCA) student Jiavu Liu designed an LED installation that reacts to wind pattern data collected from 40 Chinese cities. The real-time data visualization installation, entitled Within Invisibility, explores the connection of the invisible force of wind and a city’s climate, landscape and infrastructure. The installation was part of an annual show organized by the RCA and was Liu’s debut that draws on his previous work with real-time data visualization. 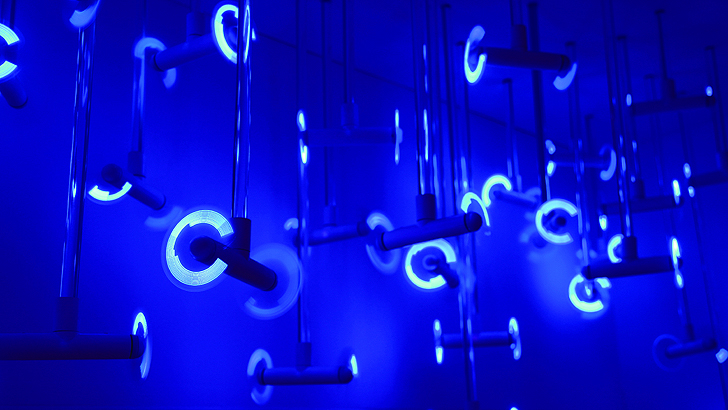 Within Invisibility is made up of 80 fans, each with 11 blue LED lights installed on its blades. It converts six hours of previously collected data material into six-second rhodonea curve. Visitors can observe a different version of a full day’s wind patterns in a place thousands of miles away. Liu chose wind as an agent for showing multiple layers of data because of its universality and manifestation through visual and tactile expression. Its immediate consequences can be not only seen, but also felt.